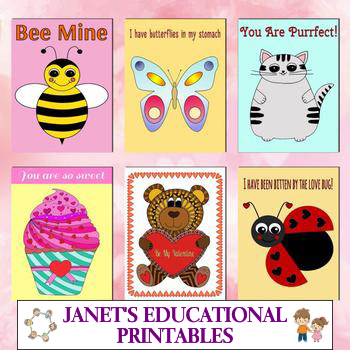 A set of 6 printable Valentine's Day cards (sized at 5 x 7 inches) featuring a bee (comes in 2 versions), a butterfly (comes in 2 versions), a cat (comes in 3 versions), a cupcake (comes in 2 versions), a teddy bear (comes in 2 versions) and a ladybug. Each card comes in JPEG and PDF. Commercial use allowed. You are allowed to sell your finished items using my cards but you are not allowed to resell them in their original form (as is). If you like to color your cards yourself, you may be interested in my Valentine's Day Coloring Cards. 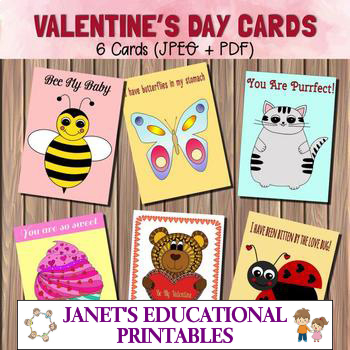 Find free and premium educational printables at www.educationalprintables.com.